MINISTER’S ISLAND, N.B. — There are ghosts at Covenhoven. I heard them. The spirit of Van Horne is intimated in each surprising twist of architecture, but it’s Benny and Billy and Beverly Ann whose influence is most clearly reflected in each peeling corner of wallpaper, flake of paint and neglected gable. Phantom guests wander the boathouse and their shadows drop shallowly over the dry pool. I heard the ghosts first while standing in the mansion’s foyer. William Cornelius Van Horne’s bedroom was behind me. The president of the Canadian Pacific Railway at the end of the 19th century—a prankster and brilliant businessman—didn’t sleep much and so he chose for his summer-home bedroom a room just off the grand entrance, where he could slip outside without disturbing his wife, children or house servants. I had turned to look at one of the few pieces of artwork in the house that wasn’t painted by Van Horne himself. 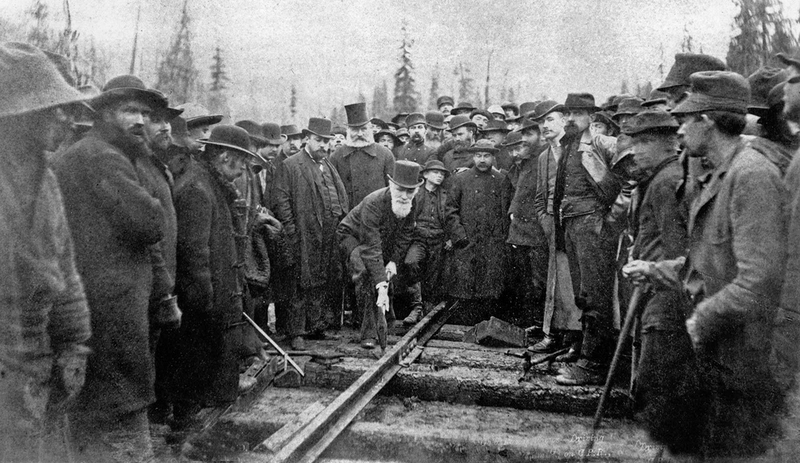 Rather than by him, it was of him, present as the last spike was driven into Canada’s proud transcontinental railroad. With him, among other famous railway men, is philanthropist Donald Smith driving the spike; Sam Steele of the NorthWest Mounted Police; Tom Wilson, purported to be the first white man to see Lake Louise; and Sanford Fleming, who looks rather like St. Nick and is the inventor of time zones. The ringing in my ears, like metal wheels sliding to a halt on metal rail, only lasted a moment, but it raised gooseflesh up my sunburned arms. No one around me seemed affected. Obediently I followed my tour group to the grand dining room, set with CP dining ware of the time. I hung back to take a few pictures and to peek into the butler’s pantry, one of the few rooms that hasn’t been altered and assaulted by post-Van Horne owners. Then, through a side door and up a flight of narrow stairs, the decay becomes heartbreakingly obvious. Covenhoven is built on Minister’s Island, a lovely piece of forested and grassy rock that is accessible by driving one kilometre on the ocean floor at low tide. In Van Horne’s time it was a working farm with award-winning cattle and Clydesdale horses. It has fallen into grievous disrepair. Through the servants’ quarters, past bare rooms that echo softly and into a hallway with a frosted skylight never designed to withstand a Canadian snowfall, I stepped into Van Horne’s wife’s bedroom. The blue, peeling paper is original to the home—it clings to the upper wall with ancient glue, battling gravity. I thought I heard quotation marks around “butler,” but maybe I was hearing things, because there was that sound again, the high-pitched steel-on-steel that I felt as much as heard. I hung back to stare out her window at the expansive lawn and sliver of Fundy before following the group down the hall to the east wing of the home. And here is where everything falls apart: not the wood and plaster, but the family itself, from the very foundation and through the next three generations, which is when the story ends. His son, Benny, was equally jovial, and like his father in other ways: he was an artist, he loved to sail, he worked on the railroad. He married in line with his social status, to Edith Molson, with whom he gave Van Horne his most beloved grandson. Although Covenhoven was bequeathed to daughter Addie, Benny, Edith and sweet Billy spent summers with her and their mother. But Benny carried a demon on his shoulders: drink. He hadn’t spent much of his youth in his rooms here at Covenhoven, but he died here, at 51. The cause was cirrhosis. Billy was the darling of the family. His grandfather painted carefree scenes in his Covenhoven bedroom for him and furnished him with—of course—metal train sets. His aunt Addie spoiled him and his Boy Scout troupe rotten. He grew into a handsome daredevil, taking to the sea and air. He collected motor boats and yachts and, in the 1930s, was a pilot for an Ontario company. And upon his shoulders, he carried Benny’s demon. His time at Covenhoven was marked by drunken parties, antics on motorcycles, hunting excursions and other dangerous behaviour. He left the wreckage of cars at the bottom of cliffs around Minister’s Island, yet it was his wife who, after a party in the village, died when her car was driven off a cliff. In the vehicle with her was a man whose relationship to her was never publicly explained. Billy would carry on and remarry, but his antics continued and upon Addie’s death in 1941, Billy’s daughter Beverly Ann was named heir of Covenhoven. Billy died five years later of a short illness that was probably cirrhosis. Pictures of Beverly Ann show a sweet little girl with a big smile and bigger bow. Motherless as a toddler and orphaned at puberty, the world seemed against Beverly Ann from the beginning, and indeed she made scandalous headlines from the time she was just 17. One might have hoped that she’d settle down on finally taking up residency at Covenhoven when she turned 21. But perhaps one should have looked at her family history and known better. She used the property as her father and grandfather had: as a party home that was a haven for drugs and drunks. Beverly Ann shot a man to death at a party at her Laurentiens home in 1960 and, though she was acquitted of murder, her public story mostly ends there. She appears to have died in Florida in 1998, leaving no heirs. Twisting down the east stairs, I found myself back on the main floor, following the group into the billiards room. But my heart wasn’t in it any more. My heart was with the ghosts of Benny and Billy and Beverly Ann, who couldn’t find happiness in this beautiful home. The last room in the house has dark wood shelves and warm painted walls. Summer light pools on the hardwood floor and dust carouses in the sunbeams. This is the room where Billy died. This is the room where his funeral was held. And at that moment, for the third time, I heard the feedback, the steel-on-steel ringing in my jaw and ears. I let my breath out and turned away, walking the few steps to the outdoors, the saltwater air and manicured grounds, blinking in the sudden light. The ghosts weren’t so obvious on the outside, but they were not gone, especially not on that summer day. There’s nowhere they’d rather be. Minister’s Island can be accessed once a day, at low tide, by driving, walking or cycling one kilometre over the ocean floor. Van Horne purchased Minister’s Island in 1890 and named his summer home Covenhoven in honour of his father. The two guest rooms in the 50-room summer home have the best view, over the manicured lawn, down to the round bathhouse and stunning Passamoquoddy Bay beyond. Even in his most relaxed setting, Van Horne was a consummate businessman who knew to save the best of everything for his associates. Van Horne made additions to Covenhoven through his own design and eventually with the aid of Edward Maxwell, the architect behind such landmarks as Montreal’s Birks building, the Chateau Frontenac in Quebec City and an addition to Windsor Station in Montreal—one of many contracts he had with CPR. Van Horne had a rather more whimsical idea of how a home should be built, and Maxwell’s vision tempered that somewhat—this may be why the home is still standing at all. With no formal training, Van Horne was nevertheless considered an accomplished artist. He kept an extensive art collection including Rembrandts at his Montreal home and covered the walls if Covenhoven with his own visions. This is his last work of art. The sketch was nearly completed, but he died before he could start painting. There are two gilt pillars in the grand foyer that had been painted over in the 1970s. One was lovingly restored at great cost to the province of New Brunswick. The other was painted to match by a production company that filmed at Covenhoven. It is nearly impossible for a casual visitor to tell which is which. Van Horne painted a border in grandson Billy’s bedroom. It is peeling and falling apart, so the province has hung a reproduction near it until proper restoration can take place. Billy was Van Horne’s beloved grandson. Of course he had intricate metal trains to play with. With Beverly Ann going through her own dramas in Quebec, Covenhoven was sold on the cheap in 1960 to a group of American businessmen who planned to transform it into a hunting lodge. In theory it is the idea setting for a manly centre of manliness. In reality it is home to, at most, two dozen deer. Assuming the huntsmen had only a moderate skill level, that herd would be wiped out within a season or two. Plans fell throughand the property’s descent continued. The hunting-lodge people offloaded the property in 1971 to a real-estate developer who planned to turn Covenhoven into a hotel. A great idea in theory, the mansion had already begun to decay and such upgrades as bringing electricity to the island were financially out of reach. The developers made a last-ditch attempt to make Covenhoven pay off. They held an auction in the foyer to rid themselves of Van Horne’s furniture, art, rugs, silverware and legacy. At nearly the same time as the auction, the esteemed railroad man’s Montreal home had been razed by another overeager developer and the Canadian soul was bruised: a protection order was slapped on Covenhoven and its furnishings, but it was too late to rescue most of the goods. Of the many things that were auctioned off in the 1970s were the dinner plates and silverware. CPR place settings are on display in the dining room of Covenhoven. The lady who purchased Van Horne’s china has said the estate can have them back when she’s done with them. For now, there’s a picture on a sideboard. Although almost everything was auctioned off in the 1970s, the province has started populating Covenhoven with period furniture. Next up on the province’s restoration wish list is repairing the wallpaper in Mrs. Van Horne’s bedroom. It’s the little things: The stairs leading to the billiard room are backed in glass to allow light to stream into an otherwise shadowed hallway. In this room, Benny died of liver failure. His funeral was also held in this room. The circular bathhouse is made of stone quarried from the beach beneath it. Narrow stone steps lead down to a changing area and then out to the beach, where a rectangle had been carved in the stone to create a tidal pool for the Van Hornes’ and their guests. Van Horne is said to have hidden train parts throughout the property, a testament to his prankster nature. 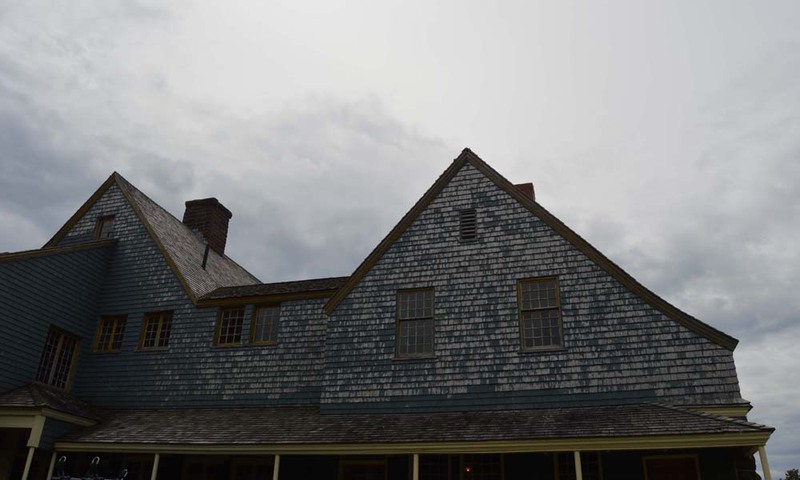 There are several interesting weather vanes around Covenhoven: on the barn, the garage, the bathhouse, and likely on other outbuildings we didn’t even notice. Minister’s Island was named for Reverend Andrews, an Anglican parson who lived in this home in the 1790s. The island remained mostly in the hands of Andrews’descendants until the sale to Van Horne in 1891, according to davidsullivan.ca, an impressive resource for all things Minister’s Island. The unique barn was also designed by Edward Maxwell. Unemployed shipbuilders made his vision come alive—which is why the loft looks a lot like the inside of a giant boat. The island was almost completely self-sufficient. Van Horne had several greenhouses on the property, raised cattle and had a creamery built to provide butter and fresh milk. Not just any old horse was welcome at Covenhoven: Van Horne was known for his Clydesdales. Van Horne died in 1915. A Unitarian funeral service was held in his home in Montreal. One of the post-Van Horne owners is reported to have asked the property manager why there were wooden boxes attached to so many trees. They were storage boxes Billy installed, to hold liquor in case he needed a fix while he was out on one of his motorcycles. Minister’s Island scores the ever-elusive five stroller wheels out of a possible five on my completely arbitrary parks scale. This provincially run park has everything: history, walking trails, adventure and even ghosts. It is dog- and kid-friendly (kids are allowed inside Covenhoven; dogs are not) and, best of all, has the greatest staff we’ve ever encountered. While I took the complete tour with a guide, Melani hung out on the front lawn with the dog and Jilly. Even with all that grass to run around on, a 2-year-old is going to get bored eventually. The staff, who had already made a great impression back in St. Andrews, where they have a stall to promote the island, headed off potential toddler and canine drama by hauling out a rocket toy for Jilly to play with and offering water, biscuits and attention to Mischou. There were kid-size chairs on the veranda and coffee and ice tea for the grownups. The staff were friendly, knowledgeable and seemed to be having as great a time as we were. It costs $10 for each person over 8 to visit Minister’s Island. This money goes to preserving and rebuilding Covenhoven, which is an important part of Canada’s history. You can make a separate donation here.